PHOTO CAPTIONS: 1. Andre in front of the cathedral, 2. homeless at night near the cathedral, 3. View from the 31st floor, 4. 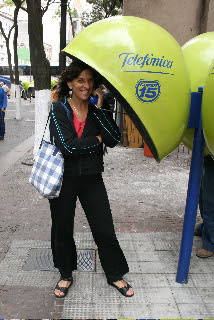 Love those phone booths! 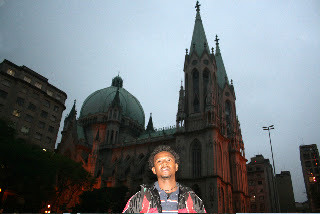 Andre and I finally arrived in Sao Paulo at 5 a.m. on October 18. Since it was so early, we took a bus and the metro to the Centro zone and found a slightly divey hotel for 25 reales (about $15). It had a private bath with hot water and the room was clean. You had to stand on a chair to turn on the TV or change the channels. Andre likes to watch TV. I don´t. Our hotel was right near a big plaza in front of a huge cathedral. 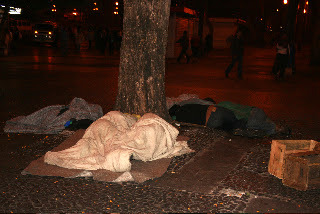 Lots of homeless people sleep in the plaza every night and no one seems to bother them. Right off the plaza were lots of narrow, cobble-stoned pedestrian streets with interesting shops, but best of all, lots of street entertainment, artists, vendors, craftspeople. I was surprised how much it felt like Europe, not Latino at all. Brazilians come in all colors, which is very refreshing. They´re also extremely nice. 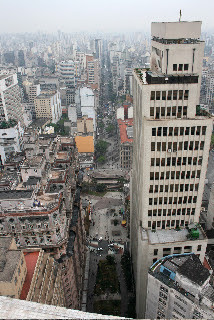 Sao Paulo sometimes felt like New York City when you look around at all the different people, but surprisingly they´re not immigrants or tourist. They´re all Brazilians and they speak only Portuguese. Even in the tourism office, the banks, the travel agencies. We can easily read everything in Portuguese since we know Spanish, but understanding it is another thing. If I ask something in simple Spanish, they understand me, but I have to watch their gestures and pointing to know what the answer is. I was also impressed with the cleanliness of the city. It´s not that Brazilians don´t drop garbage on the street, but every night they have a huge crew of people in orange jump suits who go around and sweep it, bag it, and cart it away. Everything seems so organized. The metro is a dream. I don´t know how a city of 17 million moves so efficiently. We nearly got pushed out of a metro car once when a swarm of people during rush hour shoved their way in. But over all, it was amazing to see what seemed like millions of people flowing smoothly through the underground. Many of them use those automatic cards that Maya and I saw in Hong Kong, refillable cards that you wave over the entrance and it deducts the fare from your credit. That really speeds things up. We never found racquetball courts and my MacBook died. Hence, the lack of photos. I´m mourning the loss and cursing the dead weight. I was told before I left the U.S. that my 3-year extended warranty is good at any authorized Mac dealer anywhere in the world. Except guess what? There don´t seem to be any authorized Mac dealers in Latin America. And no one´s heard of racquetball, even though I know there are courts somewhere in Sao Paulo. One of the nicest things we did was get a view from the 32nd floor of the Banco do Sao Paulo building. It wasn´t a particularly clear day. I would love to go back up on a clear day. But even still, it was pretty impressive. I hope I´ll be able to post photos sometime again. The food is good and not too expensive. Lots of fresh juice. Never did find a supermarket or even a grocery. Lots of stores that sell packaged goods and drinks, but where do they buy meat, fruit, vegetables?